The Remain Software IBM i Application Lifecycle Management solution, TD/OMS is integrated with WebSmart from BCD Software to enable PHP and RPG developers to deliver high quality and modern web applications quickly, within budget and according to best practices and standards. RPG and RPG/ILE developers see the power and lots of advantages of using this open source solution for web and mobile development on IBM i. Need for accessibility, excellent user experience, and higher productivity are just some of the reasons why companies decide to modernize their old, green screen applications and go for a modern software accessible anytime, and anywhere. 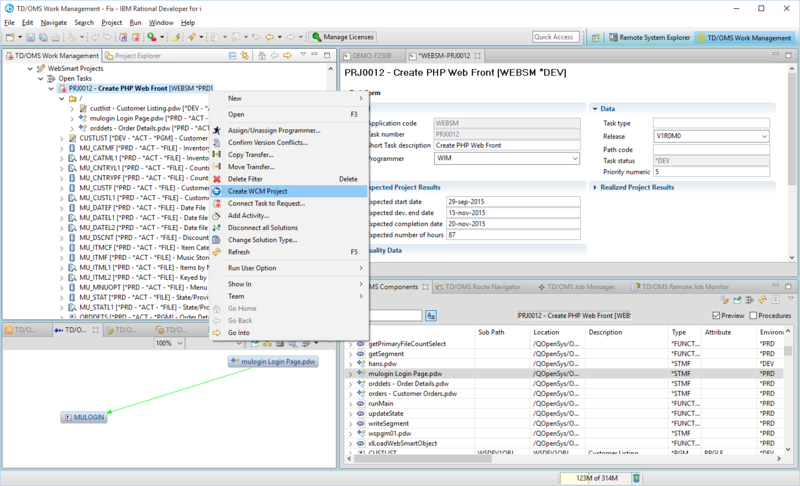 TD/OMS has been supporting PHP on IBM i development for some time now, by facilitating components management and providing a clear overview of PHP components with its graphical impact analysis module. The recent enhancement assures a reliable and effective delivery as well as complete documentation and history of applications developed with WebSmart PHP templates. Information about WebSmart PHP applications is stored and easily accessible using TD/OMS which provides a central repository for WebSmart PHP definitions and native IBM i objects. TD/OMS also takes control over the entire change and modernization process, including multiplatform deployment. In addition, TD/OMS assures control and storage of application versions with source compare and merge functionality. Remain supports the full Websmart suite which also includes Websmart ILE. The integration also provides dependency analysis on all Websmart definitions. Impact Analysis on files therefore automatically include Websmart definition files and the generated programs and PHP. The video below shows the day to day workflow of checking out, editing and running a Websmart ILE program.